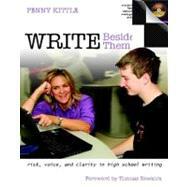 Write Beside Them debuts as the field's most comprehensive, contemporary, and practical book on high school writing. Kittle not only tells how a skillful writing teacher operates, she shows you on the accompanying DVD, with clips of kids at work in every stage of a writing workshop. And all this glorious teaching happens with real, sometimes struggling kids who remind us of our own classrooms and students. Write Beside Them is the whole package. - Harvey Daniels Author of Content-Area Writing and Subjects Matter What makes the single biggest difference to student writers? When the invisible machinery of your writing processes is made visible to them. Write Beside Them shows you how to do it. It's the comprehensive book and DVD that English/language arts teachers need to ensure that teens improve their writing. Across genres, Penny Kittle presents a flexible framework for instruction, the theory and experience to back it up, and detailed teaching information to help you implement it right away. Each section of Write Beside Them describes a specific element of Kittle's workshop: Daily writing practice: writer's notebooks and quick writes Instructional frameworks: minilessons, organization, conferring, and sharing drafts Genre work: narrative, persuasion, and writing in multiple genres Skills work: grammar, punctuation, and style Assessment: evaluation, feedback, portfolios, and grading. All along the way, Kittle demonstrates minilessons that respond to students' immediate needs, and her Student Focus sections profile and spotlight how individual writers grew and changed over the course of her workshop. In addition, Write Beside Them provides a study guide, reproducibles, writing samples from Penny and her students, suggestions for nurturing your own writing life, and a helpful FAQ. Best of all, the accompanying DVD takes you right inside Penny's classroom. Its video clips explicitly model how to make the process of writing accessible to all kids. Penny Kittle's active coaching and can-do attitude alone will energize your teaching and inspire you to write with your students. But her strategies, expert advice, and compelling in-class video footage will help you turn inspiration into great teaching. Read Write Beside Them and discover that the most important influence for all young writers is their teacher.